Florida Keys Fine Art Prints, Photo Gifts & Air Plants. Announcement Hello and welcome to my online gallery! My name is Sheri Griffin, I am a scenic landscape photographer based out of the upper Florida Keys, but I’m always traveling from Key Largo to Key West! I love to set up and display my mobile photo gallery often throughout the keys at art shows. I enjoy taking single exposure photos of sunsets, stars, moonrises, lighthouses, fish, long exposures, bridges, “old stuff” and anything that involves the ocean! I’m the crazy photographer standing up to my waist in the water with my tripod. I am also known for my "Beautiful Scenes of the Florida Keys" scenic landscape photo calendars. Custom Matte and Frame packages are available! Just message me and I will be more than happy to show you examples of what you’re looking for. LARGE photo prints are available for most photos. I can send a digital example of what it would look like on the wall of a bedroom/living room. Please inquire😊. Local framing/installment can be arranged. Please send me a message and lets get started on your custom project! I put a lot of hard work into my small scenic photo business and my photos are protected by US COPYRIGHT. PLEASE DO NOT steal my photos. My photos are priced very reasonable and they can be licensed for just about any use. JUST INQUIRE- Thank you. Small Air Plant. Blooms a pink and white flower. One Air Plant only. 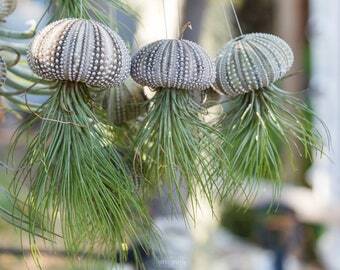 Three White Sea urchin ornaments with air plant. red/pink and purple bloom. About to bloom! Large Air-plant Turns bright pink and shoots out purple bloom/shoot. Air Plant Only.Exotic tillandsia air plant Victoriana. Two Mini Air Plants. Pink/Red Tips and shoot out a purple flower,yellow pollen center. Air Plant only. Large air plant with grass-like long strands. Tips turn bright red and shoot out a flower. Plant Only. Medium/Large pink and light Purple flower Air Plant. AIRPLANT ONLY. PUP/BABY stage medium sized air plant with pink and light purple flowers stricta hybrid. Watch the babies grow and then flower! Purple Barnacle cluster. 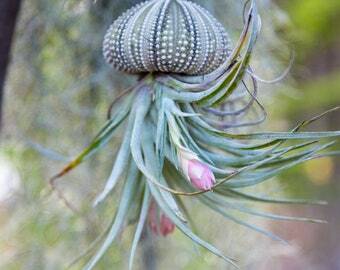 Check other listings to add your own air plants. Single Air plant Barnacle decoration with medium sized air plant. Pink bloom and purple flower. Large Air-plant Turns bright pink and shoots out purple flower. Air Plant Only. About to bloom. Exactly as described! Quick delivery. Thank you! One Large sized* Sea Urchin "Jellyfish" DOUBLE BLOOM Air Plant Ornament Pink flowers Price Includes bubble wrapped shipping. Nice big plant with several blooms. Plus a little bonus plant. Like the hook used for the big plant. Never thought about doing that but it works great. Thank you! Forever exploring and sharing the beauty of the Florida Keys, my island home. Hello! My name is Sheri Griffin, I am a local landscape/freelance photographer in the Florida Keys. I attend art shows and farmers markets in the middle and upper keys displaying my work . I have my calendars and photos in a few places from Islamorada-Key Largo. I answer my messages VERY quickly if you have any other questions! I am also VERY active selling through the holidays! Kyle has helped to design the "2018 Beautiful Scenes of the Florida Keys" calendar.